and Clive Barker's never falters. 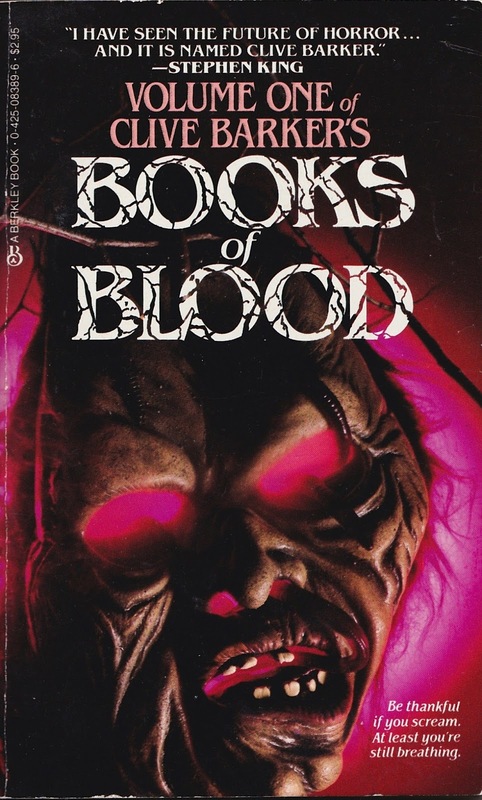 Essential part of my late '80's horror literature experience. Clive was so dangerous compared to the stuff I'd read up till then. 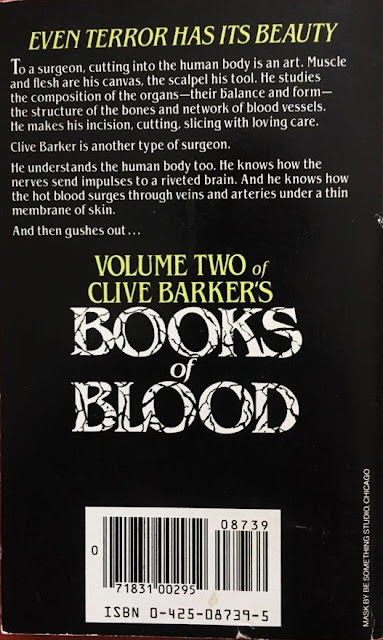 Volume 2 of the Books of Blood, the very edition pictured here, was my introduction to Barker. 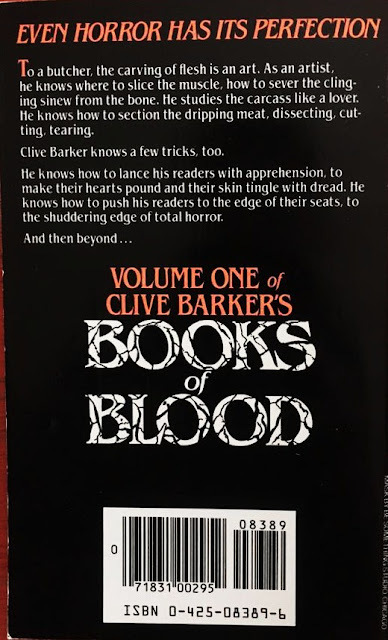 I had been on a Lovecraft binge at the time so after his oblique descriptions of unseen horrors it was breath of fresh air to read Barker's in-your-face horror. At the time he really was the future of horror as Stephen King's quote says. 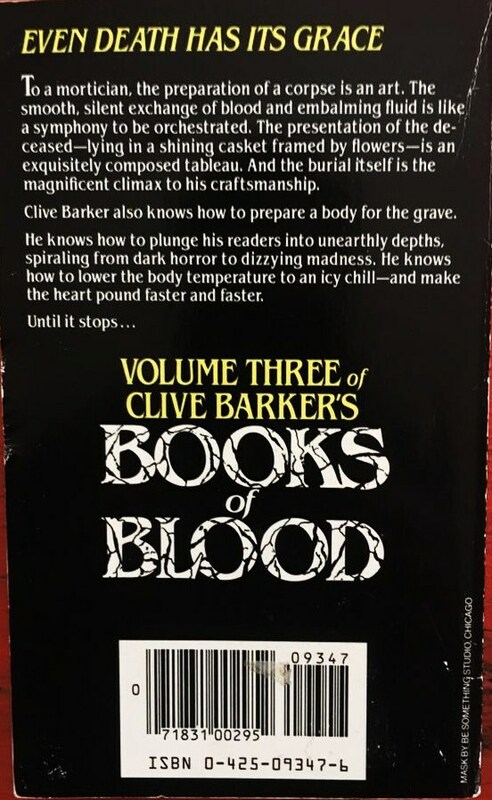 Man, the copy on the backs of these books is killer. 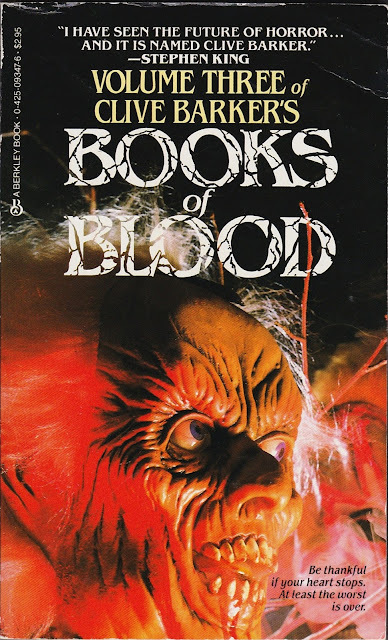 I just read the first three volumes of the Books of Blood for the first time back in April, and I adored them. Barker is a master. Really? Wow . . . compared to the original, Barker illustrated covers, these are horrendous. I wonder if it was a copyright thing, or just that US audiences weren't ready for such graphic imagery on their bookshelves. The original 'photo' covers on the true 1st editions (UK) are almost as bad as those above. Were replaced by the Barker illustrated covers, which are fantastic. Ah, yeah, those covers. I was glad to get these books under any cover art, after hearing rumblings about them for months before they came out, but when I saw those covers I was a bit bewildered. 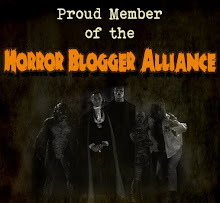 Here they had one of the major publishing events of the decade as far as horror went, and the best they could do is pick up some Halloween masks from the close-out table at Dollar General and drape some fishing worms on 'em? Must've taken them all of half an hour to design those covers. But what was between the covers, that's something different. 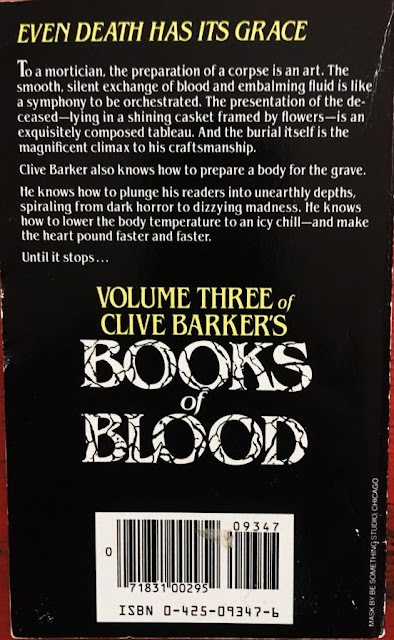 I've since gotten those three in one hardback, and have recently gone back and bought the follow-ups... you can find used hardbacks of those ridiculously cheap now. I inherited volume three from my neighbor. I think now that her son must have been bothered by my good mood, but I figured she moved into an old age home or something. I realized later that she *died* and her son was unloading all her extra stuff. What did everyone think of the stories included? I have been looking to grow my collection! Most of the stories in the first three books are pretty good. Nowadays, those three are usually combined into a single paperback. 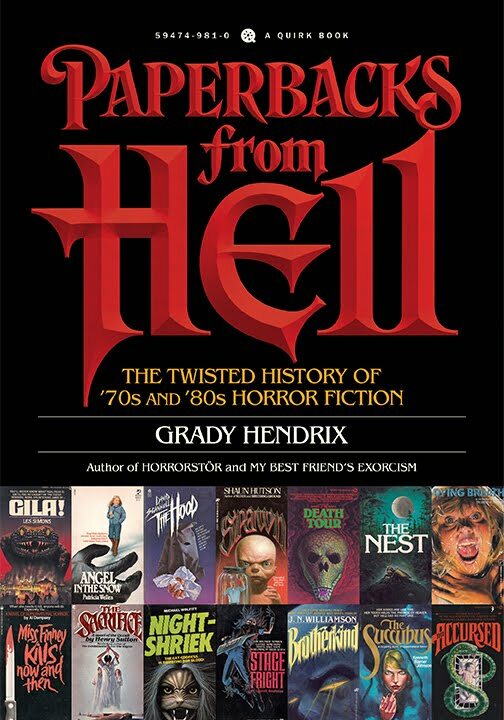 Several of the stories have been turned into movies, including The Midnight Meat Train, Rawhead Rex, and Dread. Books four to six aren't quite as good. They're usually retitled The Inhuman Condition, In the Flesh, and Cabal. 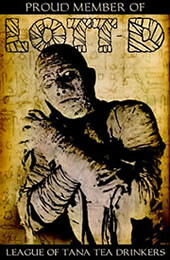 The title story "Cabal" became the movie "Nightbreed." "The Forbidden" (from In the Flesh) became Candyman. I still haven't managed to tackle Books of Blood yet, even seeing old editions in a used bookstore a long time ago, cheap, only to pass them up for something else. How foolish we can be at times. 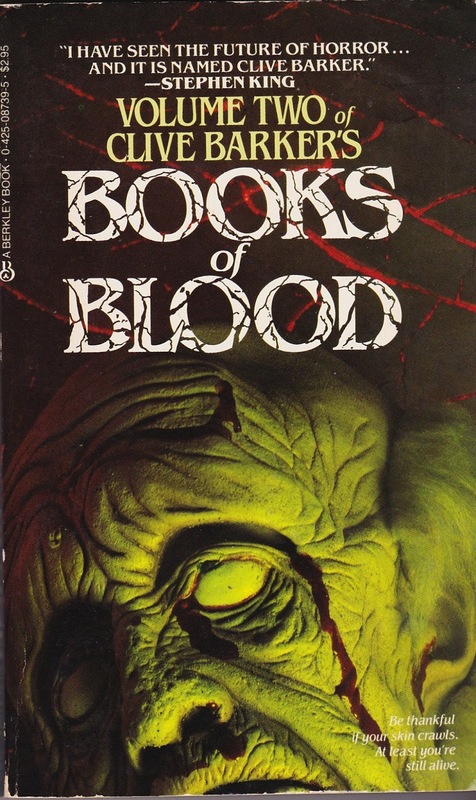 I liked his novel "Imajica" more than any of the Books of Blood, but the stories are still pretty good. Contrary to what I said before, books 1, 3, and 6 are probably the best. I also recommend "The Thief of Always" even though it's supposed to be a kids' book.